A couple of days ago, two colleagues from our Customer Service Center (CSC) in Frankfurt and I were invited to the kick-off event of LEEN 100 (Learning Energy Efficiency Network) in the Rhine-Main area. I hadn’t heard of LEEN before and was curious to get to know more about it. To put it in a nutshell, LEEN is about creating platforms for intense best practice sharing among 10 to 15 companies on how to save as much energy as possible at a reasonable level of investment. I think that’s a great idea, as we already follow the same approach at LSG Group through our network of regional environmental managers. The parties of LEEN 100 especially committed themselves to reducing the CO2 emissions of the city and to increase the proportion of renewable energy. 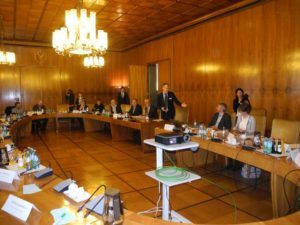 The kick-off event took place in Frankfurt’s famous city hall, the Römer and was hosted by Rosemarie Heilig, City of Frankfurt’s Director of Environmental Affairs , and Ursula Mielicke from Fraunhofer Institute for System and Innovation Research, who is part of the project team and will monitor the project from a scientific point of view. After their welcome and introduction speeches, we immediately started with our first joint workshop. I was personally impressed by Ursula Mielicke’s statement, saying that the energy efficiency improvements made by the 30 companies who took part in the LEEN pilots were double that of the industry average. Way to go! As a next step, all LEEN 100 parties will undergo an energy audit, which demonstrates potential for efficiency improvements through technologies like compressed air, electrical drives, LED lighting, waste heat utilization and the production and distribution of heat and cold. By the way, the next LEEN event will be hosted by our LSG Sky Chefs unit FRA ZD (Frankfurt) in June at Frankfurt airport. Michael Rüschenbaum, our Regional Environmental Manager for Germany, and Peter Salbreiter, FRA ZD’s head of maintenance, volunteered to guide the group of energy experts through our premises and take a closer look at our cooling and ventilation systems. After the tour, a team of qualified engineers will resume their findings and provide us with suggestions for potential energy savings. I am really looking forward to that and will keep you posted! Did you know that in 2012 the EU passed an energy efficiency directive (EED), which established a set of binding measures to help reach the EU’s 20% energy efficiency target by 2020? Under the directive, all major enterprises in EU countries are required to either conduct frequent energy audits or to implement an ISO norm based energy management system. LSG Group as a part of Lufthansa Group will of course comply with this regulation. And we’re looking forward to using the results of this work in Frankfurt to improve our energy efficiency worldwide.